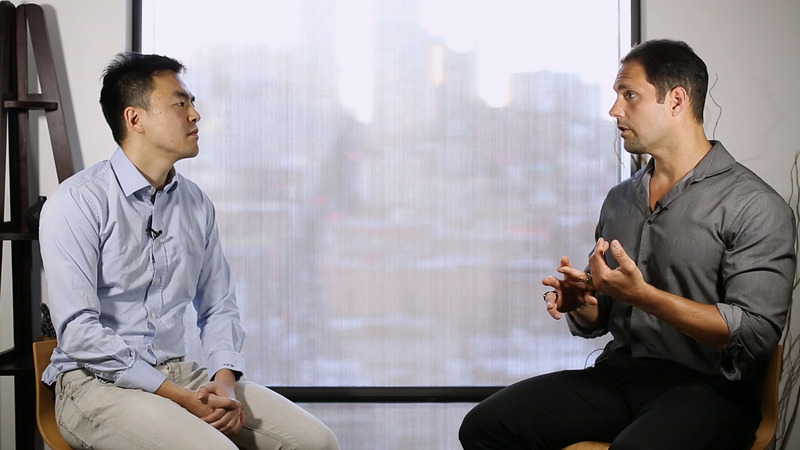 Geoffrey Woo sits down with Dr. Dominic D'Agostino, one of the leading researchers in the field of ketosis. Dominic shares his thoughts on the implications of ketone esters and what the launch of HVMN ketone unlocks. What are some of the most promising directions for ketones moving forward? Of the many benefits stemming from the ketogenic diet and intermittent fasting, which ones can be ascribed to the ketones themselves? Geoff: Hey this is Geoffrey Woo from HVMN, and we're real excited to launch HVMN Ketone. As a part of this launch campaign, we're hosting top academics in the field of ketosis, and giving their own personal perspectives around their own personal research into ketones, as well as the development of the entire space. I'm excited to have our first video perspective from Professor Dominic D'Agostino from USF, one of the premiere researchers in ketosis today. Excited to have this conversation. Dominic : Great to be here. Thanks for having me. Geoff: Of course. You've been a widely published and cited author in a number of papers on endogenous and exogenous ketosis. I'm curious, in your experience, what was one or two of the most exciting moments that you've personally had in your research in exogenous ketones? Dominic : One or two, man we had a bunch, but I think the thing that's most memorable was the first time we took an exogenous ketone and we administered it acutely in a rat model, and subjected that model to a very strong stimulus of oxygen, high oxygen, which typically evokes a seizure in about five to ten minutes. In a state of therapeutic ketosis, we could extend that 600%, and that happened from the very first animal that we studied, and every animal that we studied after that, we saw an extension. I remember we were all kind of standing around the hyperbaric chamber and watching the neuroprotective effect of acute ketosis. I was under the impression that it had to be produced and sustained for a week or two, but we didn't actually have the money or the means to administer that amount in that amount of time, so that would be like number one. I think the second observation that really got us excited was the observation that adding ketones to a standard diet, a high carbohydrate, standard rat chow, extended the survival time and suppressed tumor growth in an animal model of metastatic cancer. That all happened within a year or two when I first studying this in about 2009 or 10. They are very memorable moments in my ketone research. Geoff: Oxygen toxicity and cancer, especially cancer, is one of the pernicious diseases affecting humans, and I think that is just one of a potential indication of ketosis or exogenous ketones. I'm curious to zoom the scope out a little bit here and talk about the broad spectrum of ketosis, what do you think some of the most promising directions moving forward? Dominic : It used to be the ketogenic diet specifically for pediatric epilepsy, when I started studying this, and there really wasn't any other applications for ketosis. Dominic : Maybe obesity. Clinically accepted standard of care applications. That's how I define it. Now it's expanding and blowing up to so many different applications. I think one, and it may apply to many different disorders, is the effect of the ketone metabolite suppresses inflammation, specifically the NLRP3 inflammasome, which we know is kind of a hub, and when it's activated, it sets off an inflammatory cascade in the body that, if prevented, or suppressed, could prevent the early initiation of age-related chronic diseases. We know that cancer, one of the hallmarks of cancer, is inflammation, so chronic inflammation causes genomic instability that can kick on author genes and cause cancer. We know that things like Alzheimer's disease and even epilepsy, many forms of neurological diseases, are result of chronic neuro-inflammation, whether it be caused by environmental factor, or a virus, or just amyloid plaques and things like that. I think the observation that a endogenous metabolite is working as a signaling molecule, independent of metabolism, as a hormone, like a signaling molecule, and suppressing inflammation, I think that's very exciting that we can do that through a number of different means, whether it be intermittent fasting, ketogenic diet, or ketone supplementation, which would be the option for people who are unwilling, or unable, to implement a strict nutritional strategy to elevate that metabolite. Geoff: I'm actually curious to dive in to that point. This is something that is just an active area of research. I don't think there's a definitive answer. Of the effects of a ketogenic diet or intermittent fasting, what subset of those indications or down chain effects do you think, would you ascribe to just the ketones themselves? Dominic : That's a good question and we seek to gain insight in to that question based on some of the work that we're doing. I personally believe that a modified form of the ketogenic diet with ketone supplementation may be optimal for a number of disease pathologies, maybe performance, but the jury is still out on that. I think undoubtedly there are some benefits that you get like autophagy, with fasting, intermittent fasting, and there may be some benefits to the ketogenic diet, or that you get with a ketogenic diet, that you may not get with exogenous ketones alone. I do think that a wide range of neurological pathologies and things outside of the brain, too, that are responsive to ketogenic diet therapy, will also be responsive to exogenous ketone therapy. There's many ones off the top of my head, but type 2 diabetes, for example. You have observed, we were talking about it, and I have observed, that there is an acute and pretty good sustained suppression of blood glucose. Dominic : And insulin, and that's huge considering that type 2 diabetes, insulin resistance, is a huge problem, which is an underlying problem that if not addressed, leads to early onset of chronic diseases, potentially Alzheimer's disease, definitely cancer, too. Many different types of cancers are linked to hyperglycemia and hyperinsulinemia. Just being able to mitigate that with a supplement, and we've done quite a bit of work with Metformin and the exogenous ketones can blow away Metformin when it comes to suppressing, reducing blood glucose levels, and even reducing insulin levels. Geoff: That's a really good anecdote with Professor Tim Noakes coming saying that, wow, compared to Metformin human ketone was able to suppress much more aggressively. That's interesting. Dominic : Just think about the effects of the ketogenic diet or low-carb, doesn't even have to be ketogenic diet, and its ability to put type 2 diabetes patients into remission in a relatively short amount of time. The work that Jeff Volek and Stephen Phinney are doing with Virta is a pretty dramatic example of that. There are some people I just know communicating with hundreds, if not thousands of people, that are just unwilling or unable to do a ketogenic diet, or even a low-carb diet, and we know from our work, and me taking various supplements personally, and watching other people take supplements too, and looking at their blood work, that even if you're not on a carbohydrate reduced diet, you get a significant benefit in reduction in glucose. And we don't know what that means long term because we just don't have enough studies yet, but one can imagine that if you're pushing biomarkers down, inflammation, insulin, lowering blood glucose, elevating ketones, I know my C-reactive proteins are almost non-detectable now, where it was always mid to upper elevated before I got on to the ketogenic diet. These things are gonna pay big dividends for our longevity. What are some of the biggest misconceptions with exogenous ketones that you've received questions about? Dominic : There's quite a few. I would say maybe the first one would be, if you drink exogenous ketones, that it's a weight loss supplement. I think it could, inadvertently lead to weight loss, but consuming ketones in and of itself is not. Geoff: It's an extra energy source. Dominic : It's an extra energy source, so you don't, by virtue of the laws of thermodynamics, you typically can't put more energy into a system and expect your body. I do think that continuous consumption may improve metabolic health in a way that could enhance your fat oxidation capacity. Geoff: I guess our research lead, Brianna, has a paper accepted in to Obesity. I think it will actually be published very, very shortly, showing that ketone ester drinks reduce ghrelin hormone. Geoff: It might not directly lead to weight loss, but it may reduce appetite, and therefore potentially, overall reduce calorie consumption. Dominic : I think it makes insulin and ghrelin work better, and can maybe normalize these, especially in people who have been eating a surplus amount of calories, or a high carbohydrate diet. I think a lot of people are concerned about insulin, too. I know there's a misconception, or some early data showing that IV infusion of ketones can increase insulin, or maybe when it's taken in a big bolus, you get a spike in insulin that could be lipogenic, could make you store fat. In the real world scenario, maybe even a little spike in insulin could be beneficial as far as enhancing metabolism in different ways. What we see when we incorporate exogenous ketones, whether they be esters or ketone salts in to the diet, there's generally an enhancement of insulin sensitivity and a lowering of baseline insulin, so that's what's most important, I think, which could potentially lead to greater fat loss over time by enhancing insulin sensitivity. Then you also, in theory, and even in practice, when you administer ketones, you see a decrease, we talked about this, in blood glucose, suggesting that ketones are enhancing glucose disposal, or maybe reducing hepatic gluconeogenesis. Improving glycemia, which could be a significant therapeutic effect too, and maybe getting the tissues to use glucose in a better way. Some people are concerned about adding carbohydrates and ketones at the same time, and producing potentially ketoacidosis. The potential for that happening is not really a concern because you would have to consume an amount that would really be self-limiting. You really wouldn't be able to consume an amount that would put you in to ketoacidosis. Geoff: I think the ranges that we expect with human ketone is between three to five millimole, and ketoacidosis is like 20 millimole. Dominic : You're just not gonna feel well. I know personally, I kind of feel better in the lower range, around two, maybe at the most three. After that, especially if I'm sedentary and just working at my desk, I think I have an advantage if I do have ketones in my system, but definitely no advantage, and maybe a disadvantage is levels start getting high, because it produces a mild metabolic acidosis that your body has to deal with. If you're exercising, so that could be a different story. You're adding fuel to the system. Geoff: You're already breathing out the acid. You're breathing heavier. Dominic : You're utilizing that. You are disposing of it, and the body's compensatory, respiratory and renal compensation can adjust for pH. It's a very small impact on your body's acid base balance, drinking ketones. If you run up the stairs, that's a much bigger ... Your body has to do a lot more counter-measures to balance your acid levels from doing simple anaerobic or high intensity exercise. Geoff: So Dom, with the launch of HVMN Ketone, it'll be the first time there will be a commercially available ketone ester drink that everyone can purchase and use. I know you've studied ketone esters in your research. What do you think the implications are gonna be for athletes, for everyday folks that are trying to use ketone esters? What do you think that unlocks? Dominic : I think it's an exciting experiment, because people really ... We haven't studied these in the capacity ... We know that they have effects on metabolism that have broad ranging implications for a number of therapeutic diseases, which I study mostly. I know from using it personally and just communicating with quite a few people who are using ketone salt products, who are sending me their blood work, telling me their benefits, whether it be seizures, performance in the field, diving, being in hypoxia, climbing, things like that. People are already getting the benefits of it. The introduction to this powerful ketone ester in to the market really can bring about, as you're bringing a technology to people that has wide ranging implications for human health, potentially disease, and also human performance. That's really interesting to me, and as a scientist, I am really excited to do more research. Most of what he have done have been in animal models, and I'm really excited to move our research more in to human clinical trials and human performance trials. Maybe a commercially available supplement will allow us to do that. Dominic : And expedite that process. Geoff: Very cool. Last question here, as you are looking to the future, I think we touched upon this before, but I think it might just be helpful. As we're moving in to the future, what aspects of the manipulation of ketone metabolism do you think would be most promising as we look in to the future of the research? Dominic : In regards to how the ketones can be used, in to that? Dominic : Man, I think there's a lot of potential benefits for the average everyday person. For me, specifically, maybe speaking selfishly, I do intermittent fasting maybe a couple times a week. Geoff: How long are your fasts? Dominic : I do about anywhere between 16 to 18, to maybe 20 hours on some days if I'm in the office. I found tremendous benefits from just doing that maybe twice a week. Sometimes I do it three or four times a week. Sometimes just once a week. Also, I do the practice where maybe it's a modified intermittent, where I take ketones during that part of the day to maybe further augment my metabolism and give me energy, in a way. If you were to check my blood work, it would look like I'm further enhancing and shifting some of the biomarkers we know that are responsible for us getting benefits from therapeutic fasting. So, I'm pushing down insulin father, and even spiking ketones up a little bit more. I like to use it in that way, and I think what would be ... What's very interesting is that we don't yet know the optimal way to use ketones. It will really be individualized and personalized. The stay-at-home mom may have a different application than the guy who rides cycles with his buddies after work, or something like that. Dominic : Or a Navy SEAL. Geoff: Or an NFL football player. Dominic : Exactly. I do think as creatine, when creatine came about, everyone was kind of skeptical. I remember in 1990, 1991, reading pamphlets about this when I was in high school, and now we know after dozens, if not hundreds of studies, that creatine, it's an alternative energy substrate that significantly enhances muscle energy capacity by enhancing ATP production. It actually is probably one of the most effective supplements out there. I see ketones filling that kind of situation where it allows cells to enhance the bioenergetic capacity of cells and allows them to make more ATP, but it's more versatile. It can be used, it's generating mitochondrial ATP production, it's enhancing that process. I see it as kind of the next creatine, but with broader ranging implications that could be even incorporated into the food supply. Geoff: The one I think about is like a fourth macronutrient, right? Dominic : Yes. I was going there. Actually, something that could be incorporated in to the food supply as a metabolite that has been shown to impact gene expression of enzymes and mechanisms we know could confer longevity effects, hitting signaling pathways that have anti-inflammatory effects. It's a calorie-containing substance, which has beneficial effects on energy, metabolism, and many signaling processes. That's pretty exciting to me. I'm also interested in many different whole food sources. I think consuming ketones, the ketone ester produces bio-identical ketone metabolites that we've had for many different years and enabled us to survive famine, survive starvation, and it's kind of reactivating a metabolic, or genetic program that we've largely silenced through the advent of modern conveniences, modern food. Geoff: Constantly refilling carbs all the time. Dominic : We're bringing that out again, and I think by understanding nutrition and ketogenic nutrition, and with supplementation, we can get those benefits. Geoff: Awesome. Thanks so much for taking the time to stop by. I appreciate the time. Dominic : Thanks for having me.